Stand is designed for testing of sub boards (KDIP, KDU and KDP) and the carcasses of traffic controllers KOMKON KDK. The rack for controller units*. Terminal blocks for control and input circuits. 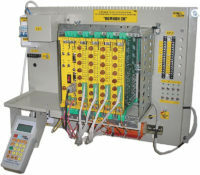 Tumbler switches and LEDsfor control and input circuits. Shelve for measuring devices and the carcass. Tumbler switch for communication line. Terminal block for communication line. *Cost of sub boards and console is not included to the cost of stand.